This has been a renowned disc since its first issue at full price in 1994. It has since then held its premium place in the catalogue with good cause. It's also generously and intrepidly packed. 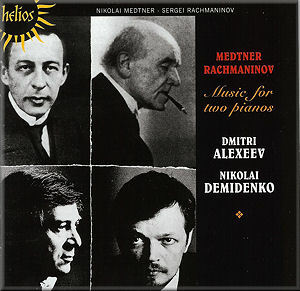 The Rachmaninov element is seasoned by the two piano pieces by Medtner. They launch the disc in a flurry of poetry and Russian chivalric élan. The two works date from the time of the Third Piano Concerto but tend to more extroversion. They were premiered in 1940 by the composer and Arthur Alexander and were recorded by the composer with Benno Moiseiwitsch for the Medtner Society series. Strange how much they, on occasion, reflect the exuberance of Arthur Benjamin's Jamaican Rumba. The Rachmaninov pieces are done with verve and a sort of volatile and explosive joy that expels any air of the mundane. We know we are in the presence of two princes of virtuosity in the second movement of the Second Suite. The Russian Rhapsody - first revived on disc by Ashkenazy and Previn for Decca - is pleasingly done. It dates from 1891 and reflects Rachmaninov still under the influence of Borodin though there are intimations of the later maturity in the second part of the Rhapsody. In the case of the Symphonic Dances I have been listening recently to the Magalhaes-Schumann duo on the TwoPianists label. I found their version of the op.45 work under-characterised and lacking that spirited impact and zest that I found in Kondrashin's recording of the orchestral version. Demidenko and Alexeev are much much closer. They catch the work’s swirl and drama with a keen blade. There’s a good sense of dialogue, of give and take, of dynamic variety and climactic structuring. The erudite but far from fusty notes are by Ates Orga. As Orga says it is dumbfounding that when the composer proposed to RCA that he and Horowitz should record the Symphonic Dances RCA rejected it. One of history's great might-have-beens. A generous disc, imaginatively produced and presenting music played with volatile flair and edgy venom.